Caused by a fungus, Ceratocystis fagacearum, oak wilt invades the vascular system of trees. The disease can cause rapid decline and even death of infected plants. Susceptibility to this disease varies among oak species; members of the red oak group decline and die quickly following infection, while white oaks tend to be resistant and recover. Live oaks are intermediate in susceptibility to oak wilt and infected trees may recover with early detection and treatment. The oak wilt fungus is spread long distance by insects that are attracted to fungal mats produced on diseased red oaks and then transfer the pathogen to fresh wounds on healthy oaks. Once a new infection occurs, the pathogen can then spread to adjacent oaks through root grafts that naturally occur among trees of the same species. This allows the disease to spread rapidly among closely spaced oaks. Symptoms of the disease include leaf browning, rapid defoliation, and branch dieback. 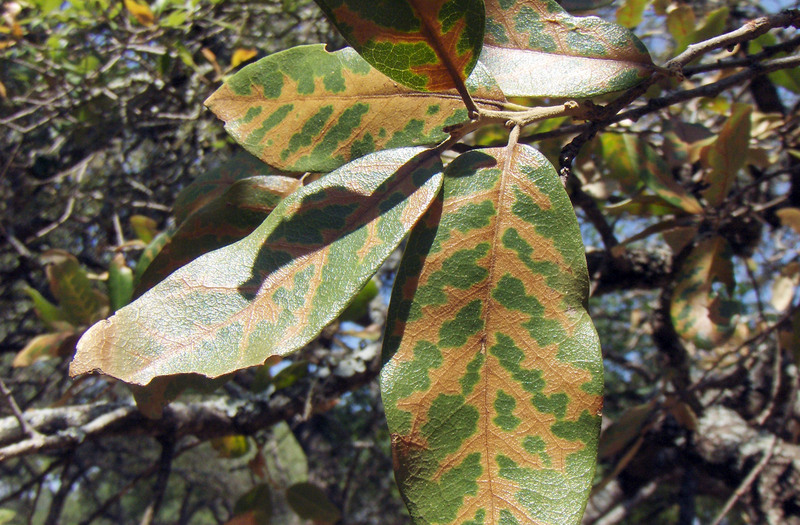 On live oaks, leaves often exhibit a distinct yellowing along the veins of the leaf blade. Oak wilt resulting in yellowing along veins of leaf blade. Oak wilt is managed through an integrated program that involves regular monitoring to ensure early detection of the disease. When new infections occur, root grafts must be severed between diseased and healthy trees to prevent local spread. Fungicides can also be injected into healthy oaks to help prevent infection. The oak wilt pathogen is not active in the heat of the summer so in areas where the disease is present, it is best to prune during this time. This helps reduce the likelihood of new infections on pruning wounds.